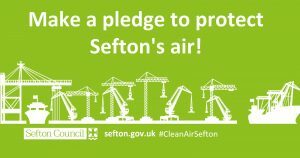 Can you help keep Sefton’s air clean? As part of its 2030 Vision, Sefton Council is committed to maintaining a clean, green and beautiful borough. This pledge encourages everybody to work together to keep Sefton clean and green, with a commitment to recycling, low pollution and better air quality. As part of this assurance, the Council has put an action plan in place to help minimise the impact of air pollution across the borough. However, there are also things that residents can do to help improve air quality in their area and in preparation for National Clean Air Day (June 21), the council is asking the public to pledge to make a small change to help reduce pollution. By undertaking these small changes, everybody can work together to keep Sefton’s air clean. When two or more people share a car and travel together, it allows more people to benefit from the convenience of a car, shares travel costs and ultimately reduces congestion and air pollution. There are car sharing websites available online or you could consider starting a car sharing club in your work place. Consider purchasing a lower emissions, hybrid or electric vehicle. These vehicles are less damaging to the environment than those with diesel engines or with a high fuel consumption. It’s not just vehicles that can be damaging to air quality, but things like burning garden waste and wood can also have a negative impact on air quality and public health. Burning garden waste is not only a nuisance to your neighbours but also releases pollutants into the atmosphere. While solid fuels such as wood, wood chips and pellets are renewable fuels with lower carbon dioxide emissions than gas, coal or electricity, they still emit pollutants like nitrogen oxide and particulates.